It's long been known that what we now call the Veblen House was a prefab originally brought to Princeton in pieces by Manhattan realtor and avid outdoorsman J.P. Whiton-Stuart. Competing stories placed the house's origins in Morristown or New York. I had been exploring various possibilities, including Bartow on the Sound, where Stuart's wife, Mary Marshall Ogden, grew up, and Tuxedo Park, where they may have resided just before moving to Princeton. Thanks to some stellar research at the Library of Congress in Washington, D.C. by Friends of Herrontown Woods volunteer Victoria Floor, we now know that the Veblen House was in fact brought here from Morristown, where the itinerant Whiton-Stuarts lived from 1916-21. Victoria was able to find correspondence between Whiton-Stuart and Oswald Veblen from 1939. Stuart clearly wants to sell the house to Veblen, saying that otherwise he would have to spend $1000 to move it to another site. 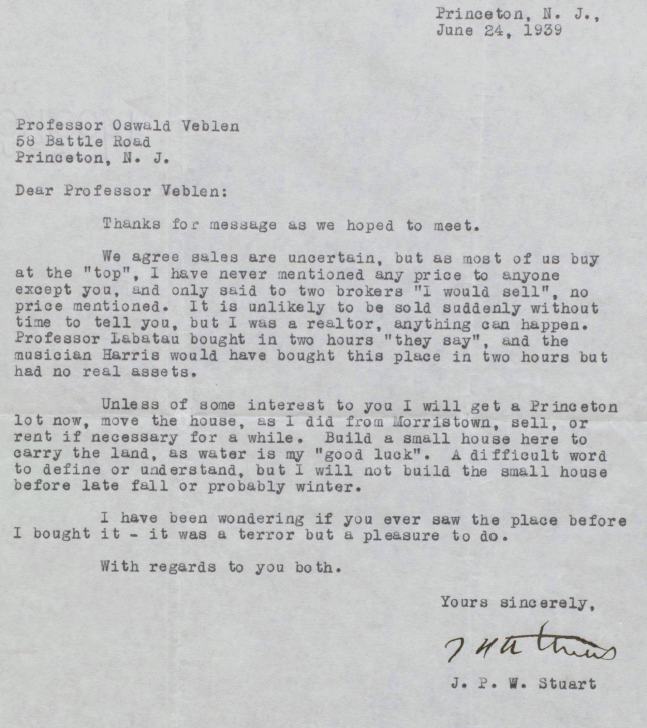 In this letter to Veblen, along with mentioning the Morristown origin, Jesse writes that "water is my good luck", presumably meaning he has a good source of water on the site, and how his work to build the house and improve the site was "a terror but a pleasure to do". We're finding our work to rehab the site, some 80 years later, is also a pleasure, so that fits. In another letter, Jesse describes the house itself, as "put together like a watch or motor, and can be unbolted anywhere, added to, etc. Every stick was oiled twice before being fit. It has two air spaces, most houses have none. It is papered and blanketed three times. Most houses have one, so it is as cool in summer as it is warm and draftless in winter. It is heated with direct and indirect hot air, at a ridiculously low cost of fuel because of insulation. It has ventilators for summer. All lumber, trim and floors were picked from old, seasoned wood, hard to be had today." All of this fits with our observations, as the wood has proven remarkably resistant to decay. The double walls have also contributed to preserving the structure. Various openings between rooms and floors comprise an elaborate system for ventilation and passive heat transfer. And in another letter, he says the house "cost over $20,000 to build", which in the early 1930s sounds like a substantial amount. Thanks to Victoria for doing this research in D.C.! Next step is to determine what origin and any prior existence the house had in Morristown. One theory is that Whiton-Stuart had it custom built in Morristown by people he knew there. Having never done historical research before, I'm surprised at how engaging it is, like putting together a puzzle, or slowly bringing an image into focus, or gathering the pages of a novel that were scattered to the wind. The closer one looks, the more treasures one finds on the grounds of Veblen House. The sugar maples were blooming ever so subtly on our March 13 workday. More showy were the snowdrops, likely planted by Elizabeth Veblen and her gardening friends, as part of an English garden that transitioned into the wilder woodland beyond in Herrontown Woods. Now that the grounds are cleared of invasive shrubs, it's clear that the snowdrops follow a berm that forms one of two ovals around the house. The ovals were probably made to divert surface runoff away from the house, but the shape also is reminiscent of a corral for horses. Some historical research is showing that the original owner, Jesse Whiton-Stuart, was a skilled horseman. Since the diabase boulders of the Princeton Ridge contribute to the beauty of this wild garden, we spent some time cleaning them of vines and leaves. Here's a 1950s photo of a portion of the grounds, taken when the Veblens were still alive. You can see that Elizabeth, born in England, loved daffodils. Thanks to Bob Wells for this and many other photos that will help us to recreate a semblance of the garden's past glory. Clusters of daffodils remain, and one of our tasks is to make sure the leaves linger long enough into the summer for the roots to have enough energy to bloom next year.